Black walnut is a hardwood tree in the hickory family that is native to eastern North America. Both the hull and the leaf of this tree have been used for centuries to counter various skin conditions, such as eczema and psoriasis. Black walnut leaf also yields its antifungal and antibacterial properties to water, so it can be prepared as tea as well as used to make topical skin washes and compresses. appearance & aroma Black walnut leaf has a strong but pleasant aroma. cosmetic Use to make herbal compresses or infuse in hot water for use as a skin wash or hair rinse (for dark shades). culinary Add to tea blends in moderation. household The leaf and hull produce a natural dye. safety May produce allergic reactions in some people. Black walnut is toxic to horses and fish. Use with Fuller’s earth powder to make a skin cleanser and mask. Infuse with witch hazel in alcohol to make an astringent toner. NOT USED for flavor in cooking, but can be added to tea blends in small amounts. The black walnut tree is ancient and sometimes considered a “weed tree” in agricultural areas. One reason that it’s so successful is because it eliminates neighboring competition by sending out a toxic substance called juglone. Many fruit trees, flowering shrubs and vegetables cannot survive within a 50-foot radius of a black walnut tree. The astringent and antimicrobial reputation of black walnut leaf is owing to the same organic compound. Description: Black walnut, a native North American perennial, grows to 120 feet in height and is found throughout the eastern United States and Canada. The bark is thick and brown to grayish-black in color with deep furrows and narrow forking ridges which form a diamond pattern. The leaves are pinnately compound, with 9-21 ovate lanceolate, serrate leaflets. Male and female flowers grow in separate catkins. The fruit/nut is deeply grooved and hemispherical in shape inside a spherical, rough husk. 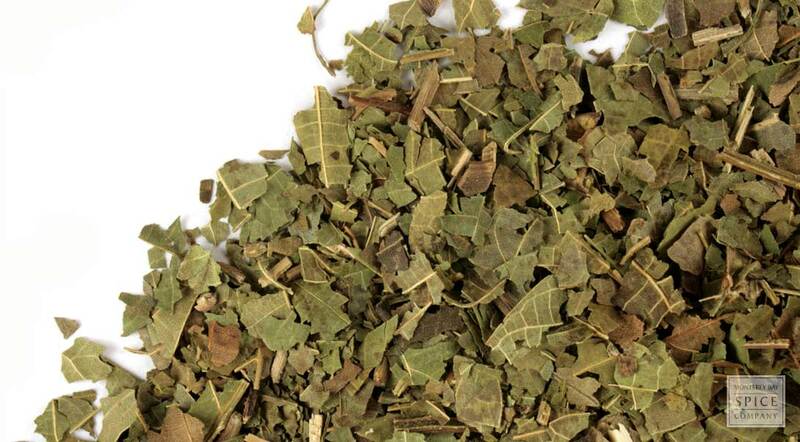 Safety: Extended use of leaf may cause mild dermatitis in some.